There has never been an open marketplace for Project Managers to directly hire AV techs and I think that should change. For Project Managers: Quickly find and hire top AV specialists you can trust. For AV techs: Get more freelance work with less hassle. Join the list to be one of the first 10 beta users to get access to the site. I have lived in 8 different cities across 3 different countries and every move has been simultaneously the best and worst thing I have ever done. It has opened me up to many new experiences and people, but being a live sound engineer is not a portable career. Every time I moved I went through a painful time intensive process of rebuilding my business. It takes a lot of time to research contacts, go around to meet everyone, and follow up to get gigs, but there is also the more difficult part of actually finding the right gigs. This you can only do by trying on a lot of bad fits before you find the right ones. Usually 3-5 years after arriving, I would have a business I was happy with. I have gotten a little faster at it every time, but every time I still wished there was a marketplace where I could offer my services directly to Project Managers, Venue Managers, and Artists instead of needing to meet 100 people to find and persuade the gatekeepers. I originally posted about this back in 2014 and have been thinking about it ever since. In 2017 I started a more formal pursuit to build my own platform. Since then I have had in-depth conversations with a score of friends and colleagues and I am now convinced this marketplace should exist, even with all of its potential obstacles, challenges and questions. And I am convinced that if enough people share my view we will be able to build something together to truly benefit our industry and help a lot of people in the process. I am aware that this idea is highly contentious and I want to be clear that my goal is not to break the current system of checks and balances that help protect us, but instead to help skilled experienced AV techs who are new to town more quickly connect with the people they can best serve and that I am completely open to all feedback on how best to do this. I hope this marketplace will be a helpful service to all as it is grown and shaped by its members. If you’d like to get involved, please join the waiting list above. 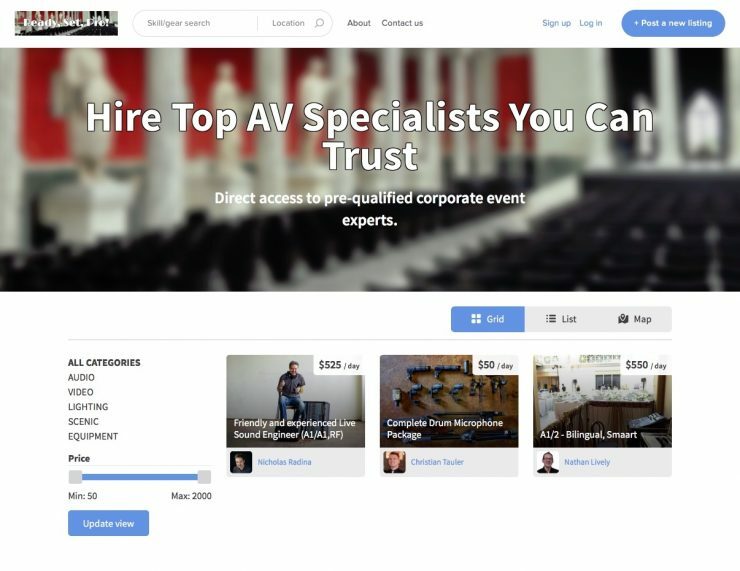 Quickly find and hire top AV specialists you can trust (the kind you want talking to your clients and running your shows). Save 20% by going direct. Get more freelance work with your ideal clients without lots of networking and job interviews. Never say no to another gig. Your calendar is managed for you. Contract: Every job hired through the marketplace includes date, service to be rendered, fee, and terms. Payment Processing: You don’t have to worry about setting up your own credit card processing solution. Safety: Unlike direct agreements, payments through the marketplace are protected so you don’t have the hassle of tracking down clients afterwards and checking on past invoices to make sure they were paid. Communication: Never lose contact with a client since messaging is built into the marketplace. Community: Join a solid professional network of colleagues working at top level.